You guys! Where is spring? This winter weather has to go! 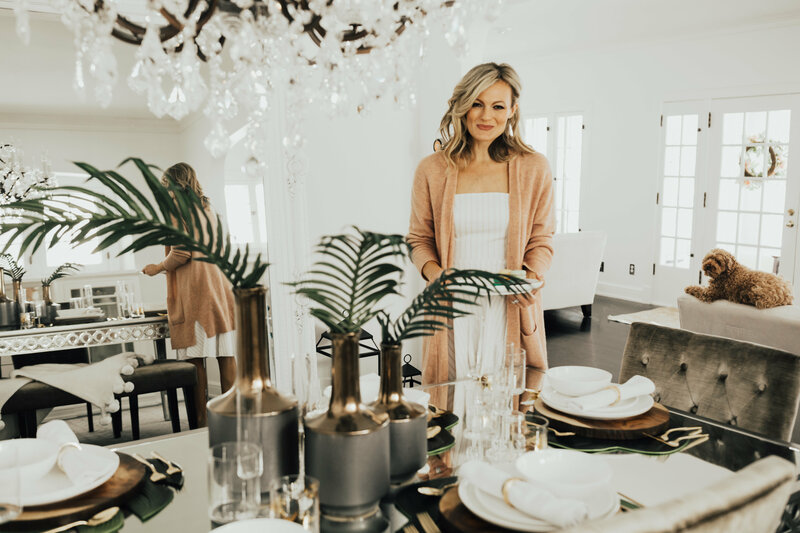 To get you into a hosting mood, I’ve partnered with Bed Bath & Beyond to bring you a spring-inspired tablescape. An entertaining inspiration that will have your guests ooh-ing and aww-ing while sipping rose all spring and summer long! 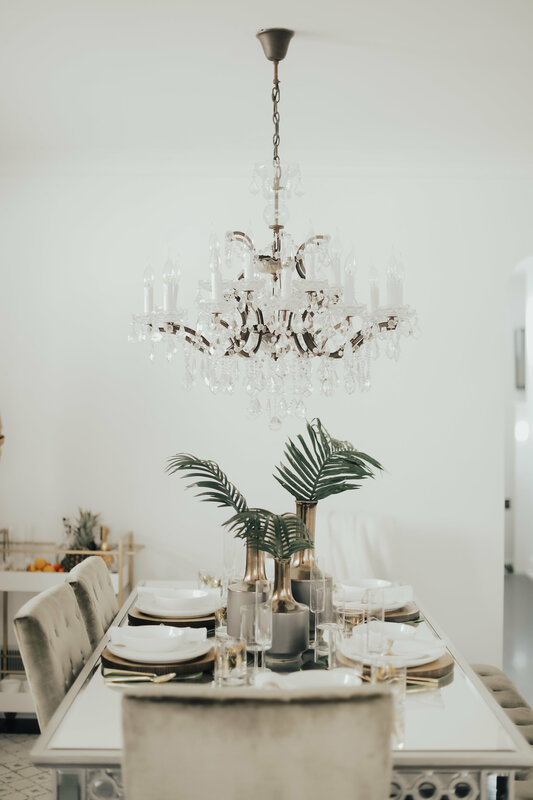 When it comes to setting my table or pulling out decor for a party, keeping it neutral is the key! When I started browsing at BB&B, I was beyond blown away by not only the selection but also the fabulous prices! I love a great deal! I love the eclectic offering of modern and traditional pieces available. Everything from fine china, cookware, entertaining, bedding, bath towels, bridal and gift registries, this is one-stop shopping made easy! If you are getting married or looking for any gifting registry needs, this is your destination! 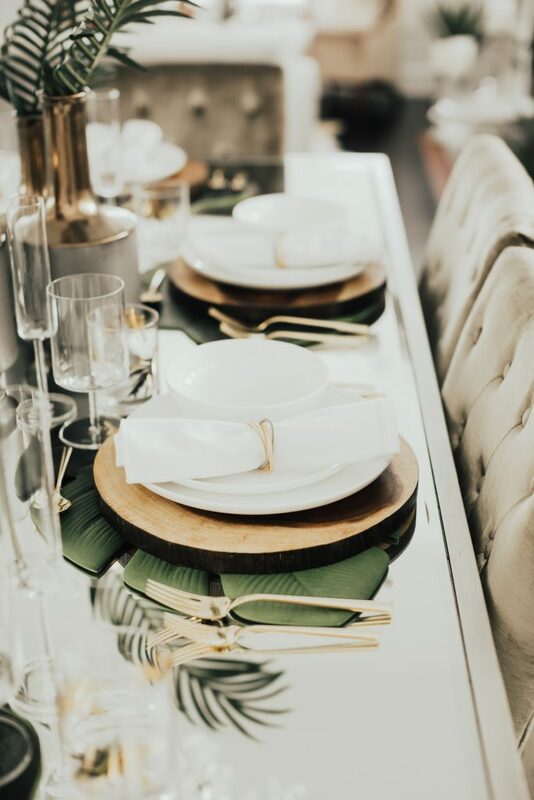 The overall look I wanted to achieve for this tablescape was airy and natural. I think we nailed it! 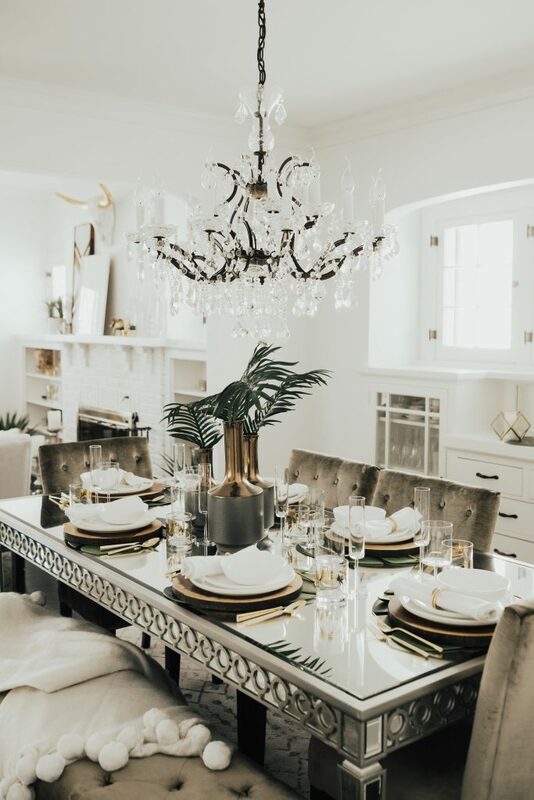 This table would be appropriate for a brunch with girlfriends, a private shower for your closest friends, a summer dinner, or just a fun-filled evening with family. My favorite pieces on the table (very hard to pick one) would have to be the beautiful glassware! I love the shape of these sleek champagne flutes and crystal water glasses. I have been using them on repeat since they arrived. These glasses bring a modern touch to the table, and the quality is top notch. I decided a pop of green would bring a fresh feel. 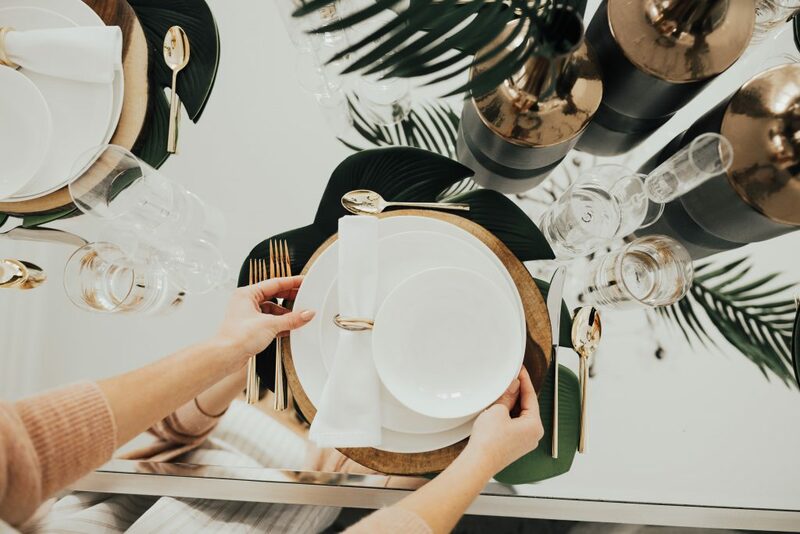 These fun Monstera leaf shaped placemats are the perfect touch. Don’t you love the color and contrast these bring to the table? And won’t these be perfect for all your upcoming outdoor entertaining? I cannot wait to repeat this same set up on our patio. Nothing makes me happier than an evening outdoors in the summertime. They are also vinyl so easy to clean and store! It’s like having an instant tropical oasis you don’t have to leave home to find! Building off the placemats, I decided to bring in a natural element of wood. These chargers bring another layer to the table and keep it simple yet attractive. The modern white china pops when placed atop the wood. I love this clean combination together. 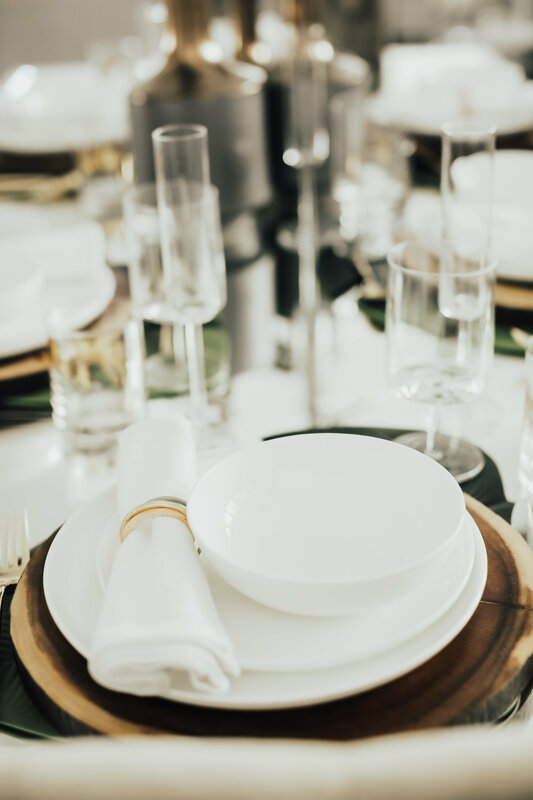 A pure white hemstitch napkin and classic gold napkin ring are the perfect pairings for a streamlined look. Nothing screams fun more than when your guests are holding a fabulous glass! 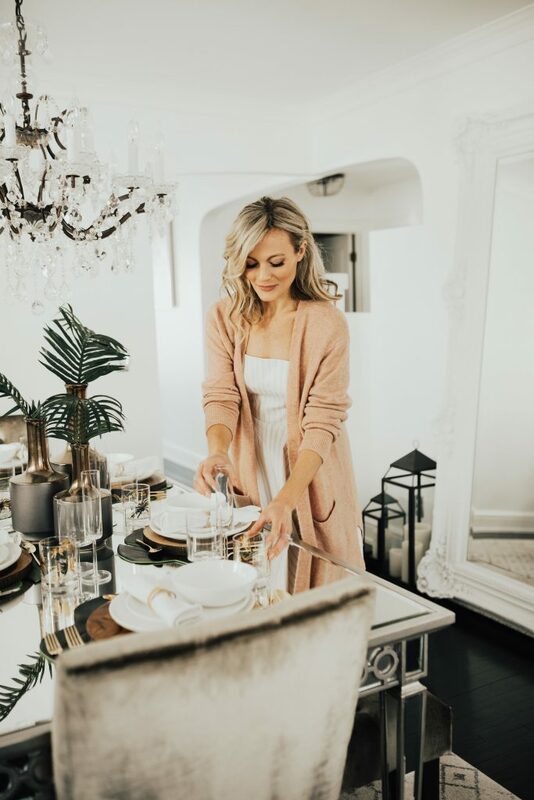 These gold leaf printed old fashioned glasses are the perfect touch! I love the look of these empty, imagine a creative signature cocktail or an orange slice on the side for something festive and fun. 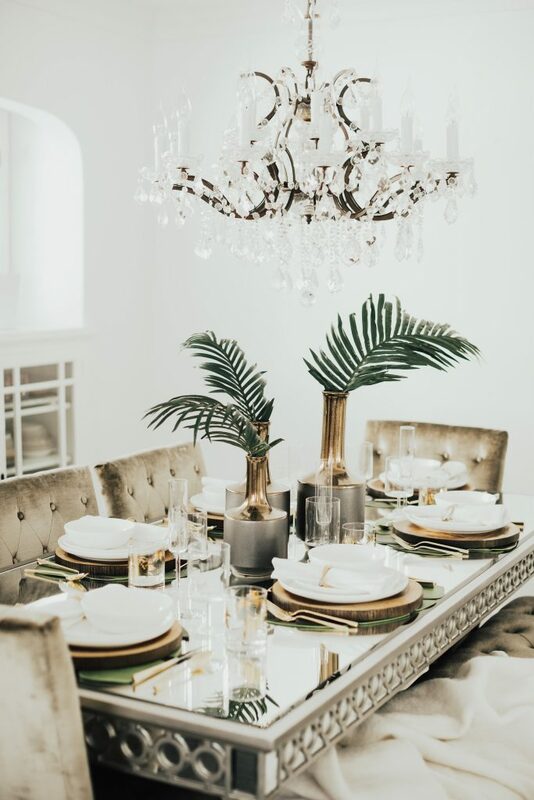 Small touches of gold are the perfect accent. 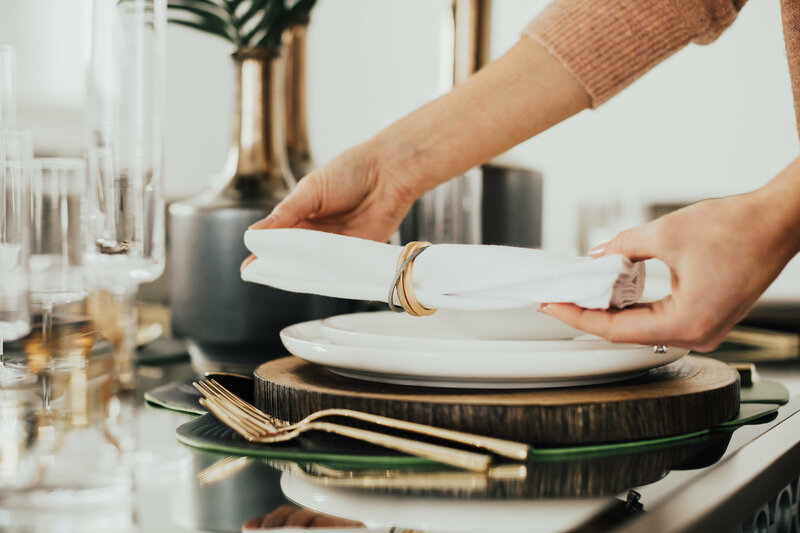 I’ve slowly been adding to our collection and if you need to start small, this Kate Spade gold flatware is the perfect beginning! Pair with silver and gold just alike and instantly upgrade any tablescape to feel modern and stylish. Let’s not forget that fabulous bar cart! 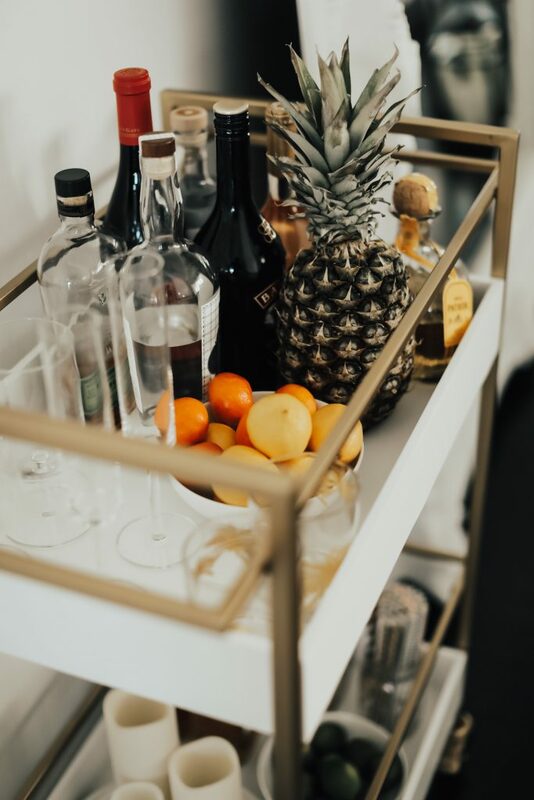 I am so in love with the look of this cart, especially with the glassware and liquor assortment. Add a bowl of limes and lemons for easy entertaining. 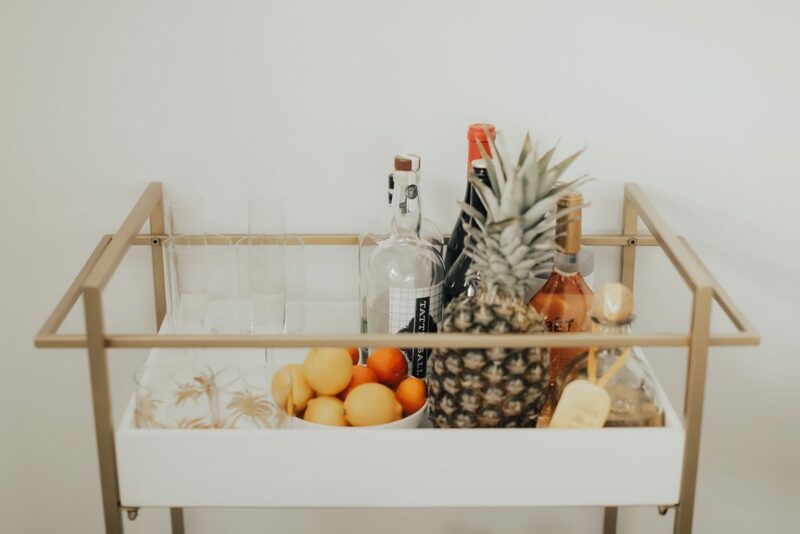 This cart could also be a great place to set up shop for your party making mixing and creating cocktails close and convenient for guests! Keep an open mind when it comes to decorating. A few simple elements can go a long way. I like adding height to the table, so these pretty vases brought a little color and texture to the table without overwhelming the central star, the place setting. I added a few leaves to continue the pop of green throughout. 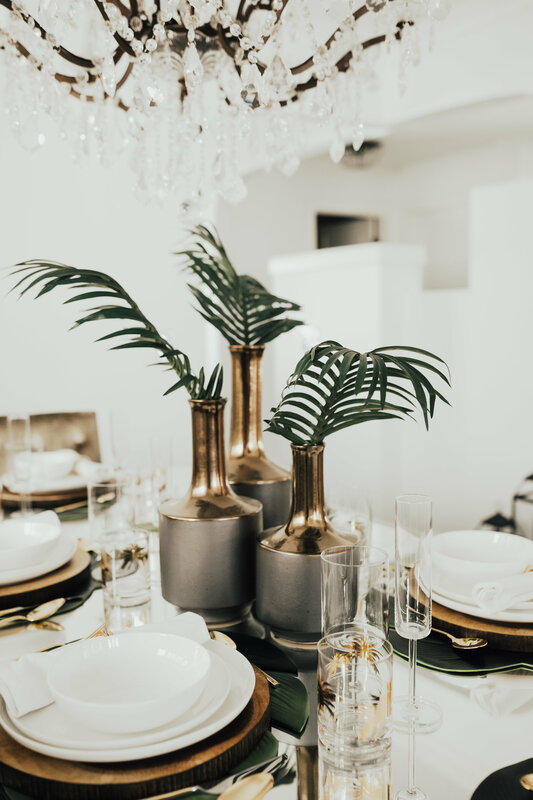 Also by placing a simple gold terrarium with a plant or candle on the back buffet keeps the overall theme going strong! A simple throw can add another dimension to your regular seating. 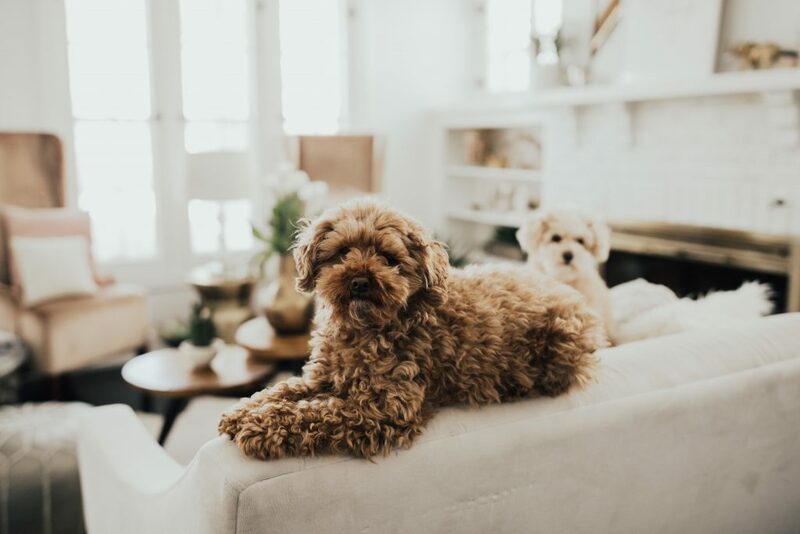 I love the idea of sitting around after a long meal and curling up with the dogs, a latte, and a good blanket. Love the pom detailing on this one because it is fun and playful. This throw also comes in a pretty grey option if white is a little too scary for dinnertime! (We have so much white in this house should be interesting when baby arrives!). Scrolling through these photos makes me long for summer days ahead! 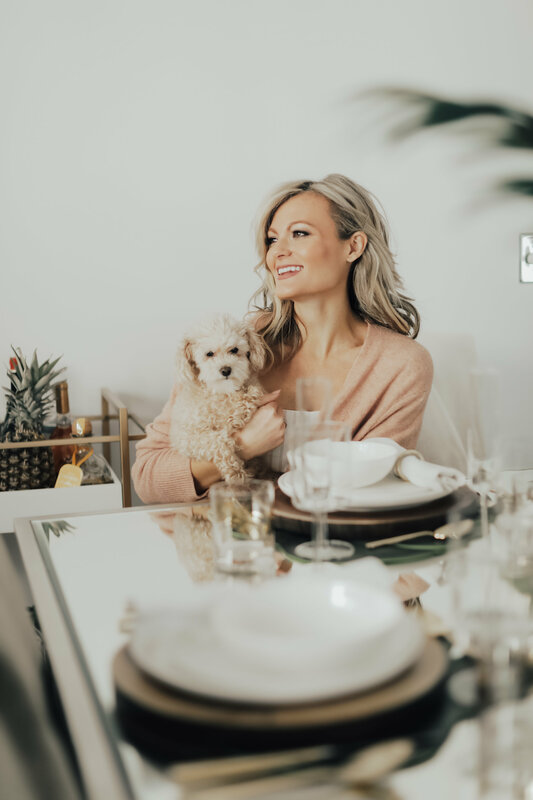 I know it will be here and gone in a flash so hopefully, a little extra dose of wintertime can help you get even more prepared to spend your time as the hostess with the mostess! I am linking all the items shown here below as well as everything I am wearing too! So scroll down for more images and all the links! Thank you to Bed Bath & Beyond for making this post possible.